HomeAll PostsContentFPP Gives Film Cameras To Kids! FPP Gives Film Cameras To Kids! The FPP’s Camera Donation Program, Up Close and Personal. On a rainy, dark morning, with the back seat and trunk of my sedan loaded, I headed out to Pickerington, Ohio. Why was I on the road before sun up? What was filling my car? Why was I heading to Pickerington? 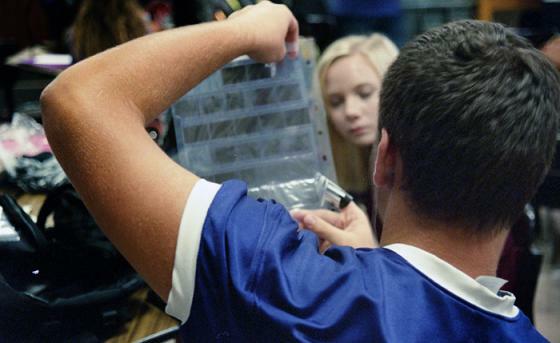 A high school in Pickerington is in need of 35mm cameras. FPP to the rescue! Pickerington is just south of Columbus and is a typical bedroom community with a population that requires 2 high schools. I was making contact with Dan Yeager at P.H.S. Central. Dan’s title is Integrated Technology Department Head, Photography; grades 9-12. Jason Wagner, Industrial Technology, also had classes going in the area where the darkroom and studios are located. Like a lot of large communities, they have a wonderful modern high school: its design is very much like a college campus. Along with this wonderfully modern high school comes a lot of operational costs and there is very little industry locally to support it. Pickerington not only prepares students with traditional and advanced basics but also is very focused on modern technology. Technology is expensive. You can imagine that finding funds can be difficult, especially for their very popular photography classes. Pickerington has been known to score equipment from places like Craig's List. Buying photographic gear, like 35mm single reflex cameras, one at a time from auction sources or postings from unknown sellers is a nightmare. P.H.S. has a fantastically popular photography and graphics program, including classes in graphic arts, video production and traditional and digital photography. 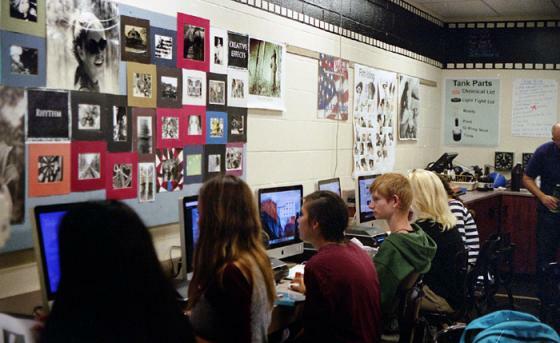 Currently 120 students are signed up in various photography classes. You can see where having enough working gear is a problem. Digital and video equipment are difficult enough to keep updated but film cameras can be a real challenge. 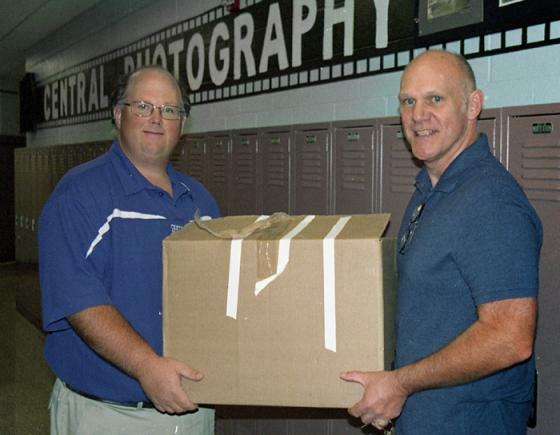 Mr. Yeager, Dan, contacted Film Photography Project (FPP) about their donation program. For him not only is locating cameras time consuming, but many of the cameras have not been used in years and are simply not viable. 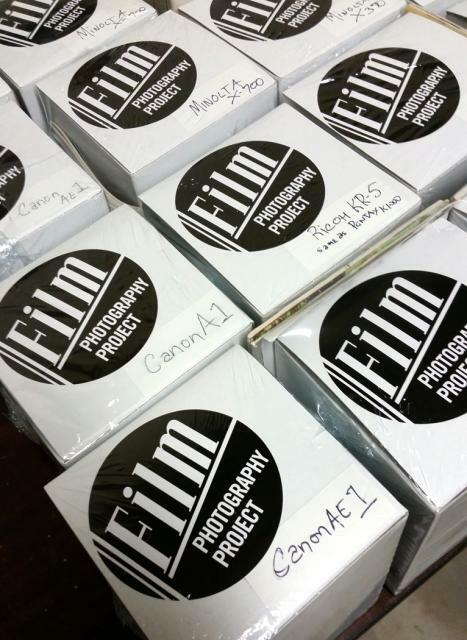 FPP’s donation program makes sure cameras are checked out and completely usable. This was P.H.S second delivery of 35mm gear. The FPP has a long history of education and donation. 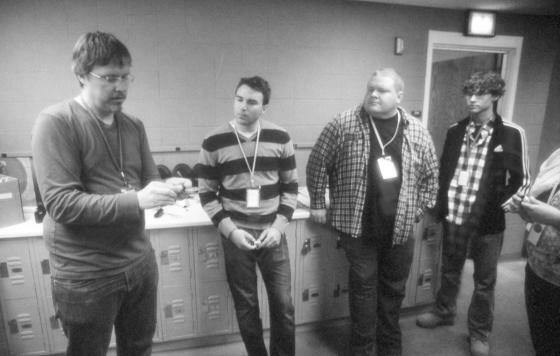 above: Mark Dalzell teaching color development in Findlay, Ohio. The Film Photography Project and it’s long running radio podcast was started in 2009 by broadcaster Michael Raso. I joined the podcast in 2012 and soon learned that Michael was accepting donations of film and traditional film cameras. These cameras are refurbished and circulated to school and student programs at no cost to those organizations. You can read more about FPP's mission on the FPP About page here. FPP donated over 20 SLR cameras with lenses on this trip to Pickerington. After my initial introduction, I passed out a stack of FPP stickers and that was a feeding frenzy! You can imagine my pleasure to hear high school students make statements like, “ I want the K1000 sticker,” or, “I want I the rangefinder sticker.” Once that was underway, I had access to the classrooms, darkroom, studio and students. 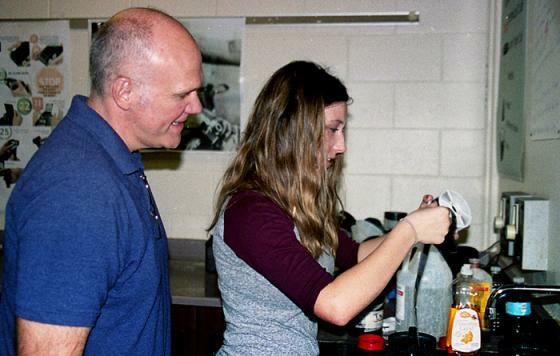 This was not the first week of classes so they were well beyond lecture and basics and could handle themselves in the darkroom, processing film and even bulk loading their own 35mm film with ease. I was impressed to see them so independent. In the main classroom there were the typical desks, but also Epson scanners, Mac computers, sinks for film processing, light tables and a mat cutter. 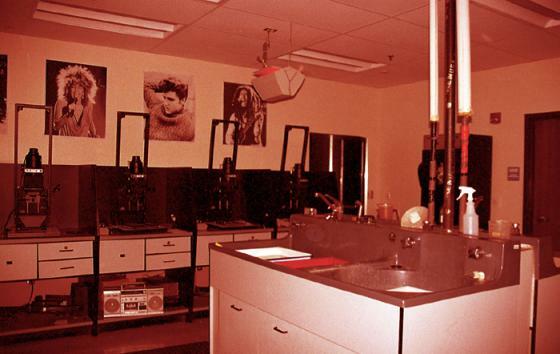 The darkroom had multiple enlarging workstations and a central area for wet processing. It was clean and neat as a pin and very well safe lit. There were also additional smaller rooms where advanced students work in traditional color, yes, C-41 and color print processing! As the classes changed, new students popped in, and they went to work on their daily assignments. I observed the above-mentioned areas all working and flowing with casual ease. Mr. Yeager zipped around the room making sure all went well and answering any questions. I was able to talk and observe to my heart's desire. So why was I personally delivering cameras to a school? On my last visit to the FPP studio, Michael Raso along with fellow podcast members Mark O’Brien and Mark Dalzell spent a day sorting, testing and prepping cameras for the school donation program. When I found out they were going to Pickerington, I offered to deliver them. Shipping is expensive and shipments like P.H.S. received are very heavy. Personally delivering helps keep the underlying cost of operating a program like this viable. I must tell you while vetting cameras and gear I was constantly amazed at the generosity of everyone who has donated to this program, from single pieces to wonderful full kits of cameras. If you have ever sent a donation to FPP, thank you so much. Your donations are being passed on to educate a new generation of film lovers like those I met at Pickerington. My next venture is to Lafayette, Indiana -- Film Photography Project, supplying cameras across the world, one school at a time. Leslie Lazenby is the owner of Imagine That! photography store in lovely downtown Findlay Ohio. Leslie has been shooting film-only for decades and is one of the few photographers in the world to shoot and sculpt Polaroid SX-70 photo manipulations. 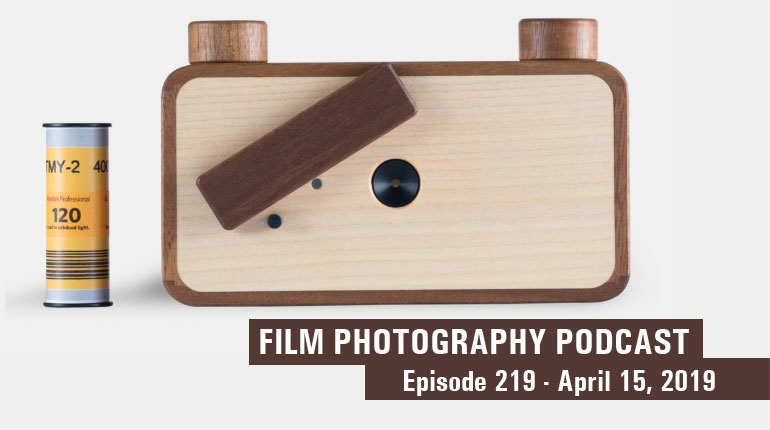 Our FPP On-Line Store supports The Film Photography Project, the bi-weekly podcast and our donation programs!